She has taught in adult education for Surrey CC and currently gives talks and workshops on a freelance basis. Janice has exhibited widely in the UK and has commissioned work in churches in S.E England. 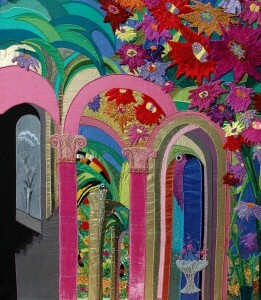 Her work has appeared in various books and magazines, most recently in “1000 Artisan Textiles”. She is widely travelled, favouring South America, where vibrant colours and pre-Columbian imagery informs some of her textiles. The icy worlds of the Arctic and Antarctica, with their fragile environments, influence the design of cool textile landscapes and panels focussing on the plight of polar bears. She enjoys hand and machine stitch – choosing what she feels is right for a particular project. Sometimes her materials are traditional, at other times plastics and sweet papers help tell a story. She has been a member of the Embroiderers’ Guild since 1970and a member of NEG since1992. She is a member of Tandridge Art Society and an elected member of the Art Workers Guild.